Credit cards used to evoke an exotically luxuriant lifestyle. What orgies of epicurean excess, for example, carried on behind the doubtlessly imposing doors of the mysterious Diner’s Club? Cardholders were a breed apart, living a non-stop, well-groomed life of club class jet-setting in open-necked shirts, or storming into lush hotel lobbies and demanding ‘I’ve GOT to get back to Bahrain!’ During the 1980s, Barclaycard – after some relatively down-to-Earth ads featuring a punked-up Dudley Moore buying records – stepped up a social gear by drafting in the jet-setter’s jet-setter, Alan Whicker. He personified the trans-Atlantic lifestyle, his swooping tones firmly associated in the public mind with the moneyed world of film stars, monarchs, shahs and sheikhs. If a safari suit could talk, it’d talk like Whicker. 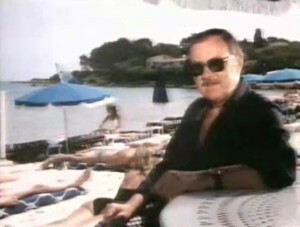 The premise was simple: in a variety of exotic locations, Whicker extolled the globetrotting virtues of what he called ‘Bu-harclaycard’ by interrogating hapless fellow travellers over the worth of their inferior plastic in a series of awkward prose poems: ‘Will it let you sample the vintage vino?/will it help you look like Al Pacino?’ Local tradesmen answered with a curt, ‘non!’ leaving the Whickster to swoop languidly in and purloin the goods with ease using his superior door-jemmying rectangle, which he claimed, with gentlemanly discretion, was ‘accepted in more places than . . . CERTAIN charge cards I could mention.’ Despite Whicker’s best efforts, most future credit card ads took their cue from Access’s classless, chummy ‘flexible friend,’ heralding the modern era of APR rates and debt consolidation, where anyone with a fixed address and a clean shirt can acquire a brace of wallet stiffeners with ease.